Fly safe, smart and in style with the DA62. Plus video! 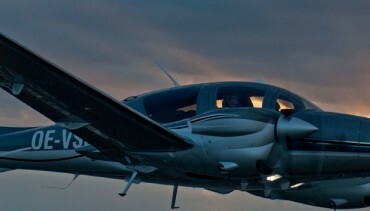 When it comes to multi-engine safety, good single-engine performance is a must. On one engine the DA62 at 2.3t MTOM can climb to about 14,000 feet. With that exceptional margin, pilots can continue safely. The standard installed Garmin G1000 glass cockpit, similar to those used in large airliners, offers unparalleled situational awareness and flight monitoring. It meets the highest expectations regarding operator convenience and better safety. A new First Class cabin, comparable to the size of an SUV, maximizes space to offer room for up to seven passengers and plenty of baggage. Enjoy a luxurious mixture of black leather, chrome, polished carbon, and comfortable ergonomic features. This monocoque cabin is made out of lightweight and strong carbon fibre composite material. Diamond have conducted full scale impact testing with instrumented Crash Test Dummies. Diamond planes offer you the ultimate durability, aerodynamic and safety. The DA62 series is powered by the Austro Engine AE330. A turbocharged common-rail injected 2.0 litre jet fuel engine (Jet A-1, Jet A, TS-1, RT, No.3 Jet Fuel, JP-8) with 180 HP and EECU single lever control system. Read more stories like these every month in GA BUYER EUROPE magazine.